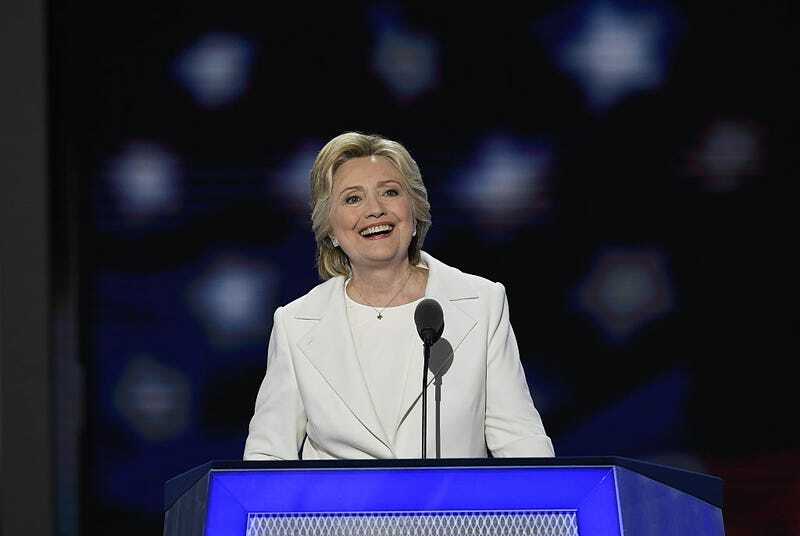 Hillary Clinton, 2016 Democratic presidential nominee, speaks during the Democratic National Convention in Philadelphia on July 28, 2016. Hillary Clinton will address the joint convention of the National Association of Black Journalists and the National Association of Hispanic Journalists in Washington on Friday, the two groups confirmed on Monday. "The format is up in the air at the moment and it is unclear if Clinton will take questions, according to a source familiar with the discussions," Darren Sands and Adrian Carrasquillo reported for BuzzFeed News just before midnight on Sunday. They also wrote, "The groups extended an invitation to [GOP nominee Donald] Trump to speak as well, as many other Latino and black organizations have done in the lead up to the general election, but his campaign has not yet responded, sources said." Fox News Latino reported, "A spokesperson for NABJ told Fox News Latino that they have also extended an invitation to Republican nominee Donald Trump to speak at the convention, but at the time was unable to say whether or not the real estate mogul had accepted the offer to speak." Clinton addressed the NAACP National Convention in Cincinnati last month, forcefully condemning recent police shootings, including the killing of officers Brad Garafola, Matthew Gerald and Montrell Jackson in Baton Rouge, La. She also addressed the General Conference of the AME Church in Philadelphia that month. The Democratic National Convention featured the mothers of African Americans killed in police custody. Then-Sen. Clinton also addressed the NABJ convention in Las Vegas when she ran for president in 2007. There, she invoked the killing that year of Oakland journalist Chauncey Bailey and discussed "a crisis of the 1.4 million young men of color between 16 and 24 without jobs and out of work, and too often, without hope." As president, Bush addressed the Unity convention in Washington in 2004, along with his opponent, then-Sen. John Kerry, D-Mass. He did not address NABJ or NAHJ separately; that convention included NABJ, NAHJ, the Asian American Journalists Association and the Native American Journalists Association. Likewise, Gore spoke to NABJ as vice president in 1996, but as a presidential candidate in 1999, addressed Unity. Sen. John McCain, R-Ariz., then the presumed Republican nominee, skipped the 2008 Unity convention for Ohio State University in Columbus, Ohio, to appear at Lance Armstrong's Livestrong Summit and Livestrong Presidential Town Hall on Cancer. In 2012, this column reported, "The Republican National Committee and the putative GOP standard-bearer, Mitt Romney, have ceded the National Association of Black Journalists convention to the Democrats, rejecting invitations to send speakers or panelists that the Democrats eagerly accepted." A story in the Los Angeles Times shamed Bush into appearing at the Unity convention in Seattle in 1999. "Presidential contenders appeared Thursday at the Unity '99 convention of minority journalists — including George W. Bush, who hastily rearranged his schedule for an impromptu walk-through. "The Republican governor of Texas ordered his staff to rearrange his schedule after a Times story Thursday reported that even though he was campaigning here he couldn't fit an appearance before the 6,000 journalists into his schedule. His rebuff provoked criticism from some at the conference, who noted that Bush has made racial and ethnic inclusion a key theme of his campaign. "Unlike two of his rivals for the White House — former Democratic Sen. Bill Bradley of New Jersey and Sen. John McCain (R-Ariz.) — Bush spent only minutes at the conference, informally greeting the crowd that quickly gathered around him. Vice President Al Gore is scheduled to speak to the group today. "As convention officials attempted to move Bush to another location for a formal news conference, several reporters shouted questions and admirers pressed for autographs and posed for photos. "Karen Hughes, a Bush spokeswoman, said a decision to alter his schedule came as Bush was en route to Seattle and after campaign officials read the morning newspapers. 'We read the L.A. Times story this morning and people were saying it was an important signal to send, so he decided to make the effort,' Hughes said. "Bush did not stray beyond an exhibition hall that was set up for job interviews. Repeatedly asked why he had not agreed earlier to attend the gathering of African American, Asian American, Latino and Native American journalists, Bush shrugged and said he gets many more invitations than he can accept. 'Do you know how many invitations I get?' he asked, adding that he didn't know he had been invited until a day before he arrived in Seattle. . . ."
The Asian American Journalists Association has invited the presidential candidates to a "town hall" event during its Aug. 10-13 convention in Las Vegas, but there has been no word on whether the candidates have accepted. Sree Named Chief Digital Officer for N.Y.C. Sree Sreenivasan, the social media expert who taught at Columbia Graduate School of Journalism, co-founded the South Asian Journalists Association and was the first chief digital officer at both Columbia University and the Metropolitan Museum of Art, has been named the city of New York's new chief digital officer, Mayor Bill de Blasio announced on Monday. "As Chief Digital Officer, Sreenivasan will work to increase access to City-led technology initiatives, focus on outreach to the tech community, and direct citywide digital policy," an announcement said. "He will begin his new role this fall. “ 'To move our city’s digital ecosystem into the 21st century, we need to ensure our city’s resources are at the fingertips of every New Yorker. With Sree Sreenivasan’s wealth of experience, I am confident that he will work to promote transparency, access, and progressive values with our digital tools, helping spread access across the five boroughs,' said Mayor Bill de Blasio. . . ."
On July 8, Carlett Spike reported for Columbia Journalism Review, "The name Sreenath 'Sree' Sreenivasan has become practically synonymous with social media. So naturally, when presented with what some might call a 'career crisis' — his employer, the Metropolitan Museum of Art, decided last month to let him go in a cost-cutting move — Sreenivasan turned to the medium he knows best. "Sreenivasan wrote a very honest note about the news on Facebook and asked his 4,996 friends for suggestions on his next move. The response was overwhelming: 959 likes, 486 comments, 48 shares, and more than 1,100 responses to his online form to collect ideas for possible next steps. . . . ."
An Iowa reporter who was praised a month ago for her professionalism in the face of racial insults has resigned from the television station. "Emmy Victor, who is African-American, said that although those negative experiences did not motivate her to leave, 'racism in the state did not help my decision to stay,'" Lauren Ehrler reported Monday for the Des Moines Register.
" 'Racism isn't really something I experienced when I grew up on the East Coast,' Victor said.
" 'Victor said she didn't have any problems in the metro area, but would sometimes feel uncomfortable when covering parts of rural Iowa. She said she would get negative reactions related to the color of her skin when she approached interview subjects and on social media.
" 'It was something I had to get used to,' Victor said. . . ."
On June 29, Arturo Garcia reported for Raw Story that “An Iowa television reporter and photojournalist captured footage of themselves being threatened by an unidentified woman while reporting on her son’s death at the hands of police. “KCCI-TV said that the reporter, Emmy Victor, and Zachary Hayes were accosted on Tuesday while covering the incident, which occurred on Monday night in Boone. “ ‘Get the f*ck out of here, you stupid f*cking n*gger,’ the woman tells Victor, who is black, before backing away. . . ."
Hundreds attended the funeral service for Alton Sterling, 37, at Southern University in Baton Rouge, La., on July 15. He was fatally shot by Baton Rouge Police 10 days earlier, as Wilborn P. Nobles III reported then for NOLA.com | the Times-Picayune. ". . . .Gerald's funeral was the first of three for Baton Rouge law enforcement officers who were ambushed July 17. Ken Spivey, an Ascension Parish Sheriff's office chaplain and a pastor at Healing Place Church, read Romans 13, Paul's instructions against resisting authorities. Spivey inserted the words law enforcement, as in: You should not resist law enforcement." DeBerry also wrote, ". . . Attending all four of those public funerals revealed the depth and width of the chasm that exists between black and white Christians. They profess to love the same God but are generally apart on issues involving the police. There seemed to be little, if any, overlap in the people mourning Sterling and the people mourning Gerald, Garafola and Jackson," referring to East Baton Rouge Sheriff's Deputy Brad Garafola and Cpl. Montrell Jackson. "Tragedies such as Sterling's death and the deaths of the police officers routinely bring church leaders to the fore. But it's hard to imagine the church pulling communities together when the church itself is split. . . ."
Barry Saunders, News & Observer, Raleigh, N.C.: White man fires at deputy and survives. Would that happen to a black man? "As a force at the ballot box, Asian Americans caught the media’s attention in 2012, when exit polls showed that they supported Barack Obama with 73 percent of their votes, a level exceeded only by African Americans," Karthick Ramakrishnan wrote July 26 for American Prospect. "That year, Obama also won a big majority of Latinos, but his strong showing among Asian Americans was a much bigger surprise. In 1992, the majority of Asian Americans had voted for George H.W. Bush, creating the impression that as an upwardly mobile and affluent group, they would continue to vote Republican. "But 20 years later, in an astounding shift, Asian Americans moved 40 points toward the Democrats in presidential elections. Since they’re also the fastest growing racial group in the United States, the change has major implications for the future of American politics. "While the attention to Asian Americans in 2012 was long overdue, much of the commentary was short-sighted and misleading. . . ."
Ramakrishnan also wrote, "To understand the shifting political allegiances of Asian Americans, we need to look closely at the evidence of their political attitudes and behavior. Recent years have seen a significant increase in survey data on Asian Americans from such sources as the collaborative National Asian American Survey (NAAS) and AAPI Data, a project that I direct. These and other surveys help to correct some mistaken explanations for the shift of Asian Americans to the Democrats, but they also show another pattern that blunts the impact of that shift. "Despite their high average levels of education and income, Asian Americans have among the lowest levels of civic and political participation in the United States. . . ."
Eugene Robinson, Washington Post: Is Donald Trump just plain crazy? “ 'Diversity' is a decent word," Avital Andrews wrote Monday for Pacific Standard. "It is. But it’s not good enough anymore — not good enough for the America that we should be working toward. "Language is a living, breathing thing that keeps what it needs and dispenses with what it doesn’t. We should acknowledge that, in English, 'diversity' is in the early phases of being phased out. "It’s gotten tired and ponderous, and it’s worth recalling that the word is derived from the same Latin root as the words 'different,' 'divisive,' 'divergent,' and 'divorced.' (One translation of diversus, even, is 'hostile.') For the ideal that it’s supposed to embody — people of all races, religions, abilities, and gender identities working side by side in hate-free harmony — it can feel as though it falls short. "Companies and politicians started weaving 'diversity' into their lexicon in the 1990s, attaching it to many well-meaning, outward-facing initiatives. But their overuse of the word is part of what has hung it with a connotation that’s forced and inauthentic. "So I started thinking about what might replace it. "Soon after, I was watching Sesame Street with my two-year-old daughter and noticed that the writers of that (phenomenal) show repeatedly use — and strongly emphasize — the word 'include' to teach preschoolers the concept of making everyone, regardless of difference, feel welcome and equal. . . . "
"Advocates say Ban-the-Box laws, which limit employers from asking job applicants about their criminal histories, reduce unemployment rates among people with convictions. But according to a recent study, they also increase racial discrimination," Wyatt Massey reported Saturday for the Baltimore Sun. Amanda Agan of Princeton University said, "Black men without criminal records are going to have a harder time getting their foot in the door." She said employers might discriminate against candidates using "race-based assumptions" about criminality, Massey wrote. "A federal judge on Monday blocked North Dakota's voter identification law after a group of American Indians said it unfairly burdens them — the latest court ruling against voting laws that critics say disproportionately affect minorities," James MacPherson reported Monday for the Associated Press. "The Navajo Times is a microcosm of the media in Indian Country," Tim Giago wrote Monday for indianz.com. "Like many of the Indian newspapers in America it gives its people a voice not to be found in the mainstream media. Free from the control of tribal government the Navajo Times has become one of Indian Country’s truly great newspapers. It is celebrating its 56th anniversary this month and so I burn some sage to honor this great Indian newspaper." "TNT has given the greenlight to what the network says will be a provocative new series with NBA legend and 'Inside the NBA' analyst Charles Barkley," shadowandact.com reported on Sunday. "Slated to premiere in early 2017, 'The Race Card' (working title) will follow Barkley as he goes on a personal journey to explore and understand why our country is so divided right now. . . ."
"TV One officially announced MEDIA, an original movie exploring the drama and secrets behind a powerful family dynasty, during its presentation at the Television Critics Association’s Summer Tour at The Beverly Hilton in Beverly Hills, California today," the network announced. "The executive producing team of Cathy Hughes and her production partner Susan Banks conceived and produced the project. MEDIA is a riveting story of a wealthy family battling the competitive challenges of keeping their status and position in the communications industry. . . . Passion, intrigue and murder become a lethal recipe for a powerful matriarch Jackie Jones and her children. . . ."
McClatchy announced Monday that veteran digital journalist Tim Grieve will succeed Anders Gyllenhaal as vice president of news this fall. "Gyllenhaal, 64, has been McClatchy's vice president, news, and Washington editor since 2010. He will leave the vice president position in October in accordance with retirement policies for corporate officers. After a brief hiatus, he will return in a new role as senior editor and director of leadership and development. Grieve will move into the vice president role on October 4 . . ."
"Last week, we told you about the unfortunate news that Craig Sager won’t be going to Brazil for the Olympics due to needing a bone marrow transplant," Ken Fang reported Monday for awfulannouncing.com. "Sager had been looking forward to working the sidelines for Team USA men’s basketball games. Well, NBC didn’t have to go far to find a replacement. It has announced that it will slide Ros Gold-Onwude from the women’s sidelines to the men’s games. . . ."
Aaron Edwards, formerly of BuzzFeed News, is one of 10 staffers hired for the Outline, a new digital publication set to debut this fall, Mike Shields reported Monday for the Wall Street Journal. Shields wrote that Joshua Topolsky, who helped to co-launch The Verge and most recently served as the top digital editor at Bloomberg, has raised $5 million to found the publication. "After more than 8 years with Univision, Mónica Talán has decided to leave her role as the company’s as EVP of Corporate Communications and Public Relations. Her last day is August 26," Veronica Villafañe reported Friday for her Media Moves site. "If you’ve never heard of Anas Aremeyaw Anas, you’re in for a treat," Richard Horgan wrote Saturday for FishbowlNY. "Because of this Ghanaian’s great success across Africa as a crusading journalist, exposing corruption at the highest judicial and government levels, he must wear a disguise on-camera and at other public gatherings to maintain professional integrity. Anas was in Worcester, Mass. July 25 to deliver the keynote address at the African Youth Excellence Awards. The interview was conducted during that visit, by website Sahara Reports. . . ."